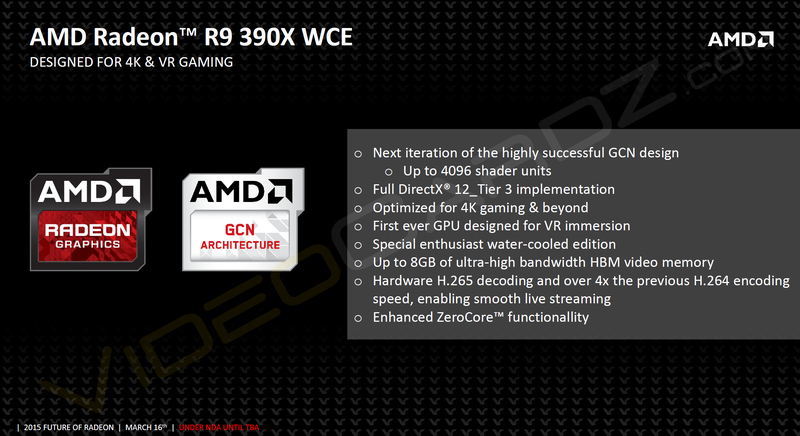 AMD R9 390X WCE, an 8GB GPU with 4096 shaders! AMD R9 390X WCE (Water Cooled Edition), an 8GB GPU with 4096 shaders and a DirectX 12 Tier 3 design and over 4x the H.264 encoding performance. This GPU should be great for 4K gaming and high quality gameplay recording. Let's hope the price is equally impressive. With such a beefy core count of over 4000, the next generation of GCN shaders and 8GB of ultra high speed and HBM (high bandwidth memory) this GPU should be a powerhouse for any kind of scenario, it remains to be seen however how this GPU will perform compare to an R9 290X or any of Nvidia's current or upcoming GPUs. Previous leaks did suggest that the R9 390X will have 4GB of VRAM, but this may be being upped to 8GB due to the 12GB frame buffer on Nvidia's upcoming GTX Titan X. The improvements to AMD's encode/decoding abilities will be very helpful for any users which are looking to record gameplay or livestream gameplay to Twitch. It remains to be seen what a full DirectX Tier 3 implementation means. It could mean that this GPU will fully supports the most recent implementation of DirectX 12, but we will not know until AMD clarifies. This slide does state that there will be a Water Cooled edition of the R9 390X, which suggests that the stock cooler for the GPU will be a Air based cooler, with this higher end GPU being a special water cooled version. Hopefully this does not mean that an air cooled version of this GPU will be thermally throttled or limited. At the minute none of this information is confirmed by AMD or any of their board partners, so as always take rumours with a grain of salt. If you look closely at the slide you can see that there is a spelling mistake, so there is a very big chance that this is not a legitimate leak. You can join the discussion on AMD's R9 390X Water cooled edition on the OC3D Forums. Read more on AMD R9 390X Water Cooled Edition here. I think that slide is a fake due to spelling mistakes and layout errors. Yeah, it could be from draft slides where the corrections had not been applied yet though still sceptic at this point as it has ticked every feature that has either be found via the internet or shown at GDC 2015. It certainly looks like it could be a seriously epic graphics card even of some of those rumors are true.